Objectives: Cervical neoplasia and some forms of infertility are caused by sexually transmitted infections. We aimed at evaluating whether positive findings on digital cervicography (DC) (performed to screen and treat cervical neoplasia) is associated with female infertility. 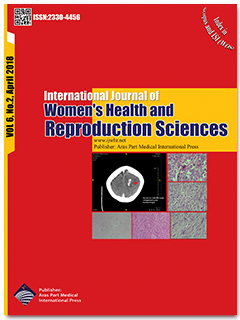 Materials and Methods: In this cross-sectional study, women consulting for infertility underwent cervical cancer screening using DC alongside women without infertility. A total of 2128 Cameroonian women were studied. Women with infertility were sub-categorized into primary and secondary infertility. Potential confounders were assessed at the screening visit and logistic regression was used to compute adjusted relative risks for the relationship between infertility and positive DC findings. Results: Among 2128 women studied, 292 (13.7%) presented due to infertility and 1836 did not; 88 (30.1%) of women with infertility had primary infertility and 204 (69.9%) had secondary infertility. Women with infertility had a positive DC prevalence rate of 15.9% compared to 13.6% for women without infertility (P = 0.31). The prevalence rates of positive DC among women with primary infertility or among those with secondary infertility respectively, did not differ from the rate in those without infertility. After multivariable adjustments relative to those without infertility, the adjusted relative risks (aRRs) (95% CI) for a positive DC were: 0.91 (0.62-1.20) for any infertility, 0.99 (0.65-1.51) for secondary infertility and 0.73 (0.38-1.41) for primary infertility. Conclusions: Results of DC were not significantly associated with infertility (and its subtypes). Further investigations are required to evaluate the association with other cervical cancer screening modalities like Pap smear and HPV DNA-testing.